You've heard and probably worn the miniature internet-connected Google Glass. The spectacle enables wearers to see, take picture of, and live-stream subjects in front of them. Miniaturisation doesn't seem to stop there. Google is now crafting a contact lens that contains tiny wireless chip that could help diabetics manage blood sugar levels. This is good news for the contact lens fans out there. According to Google the lens works using a tiny wireless chip and miniaturized glucose sensor that are embedded between two layers of soft contact lens material. "We're now testing a smart contact lens that's built to measure glucose levels in tears," project co-founders Brian Otis and Babak Parviz said Thursday in a blog post. They said prototypes have undergone clinical tests and talks were underway with the US Food and Drug Administration. The project was described as being in its early days, and partners were being sought to make the lenses marketplace reality. "As you can imagine, tears are hard to collect and study," the Google X lab team members said. "We wondered if miniaturized electronics -- think chips and sensors so small they look like bits of glitter, and an antenna thinner than a human hair -- might be the way to crack the mystery of tear glucose and measure it with greater accuracy." 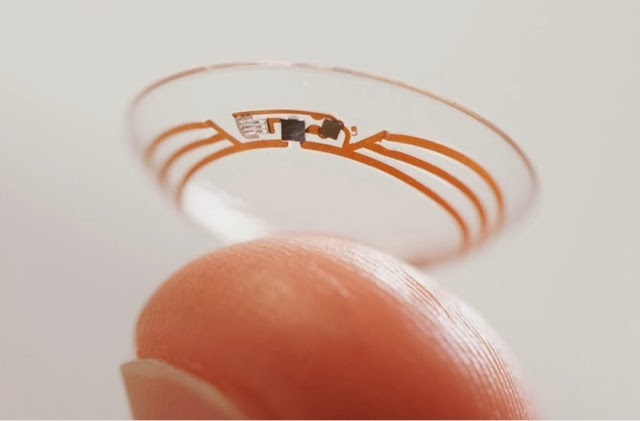 Prototype lenses being tested at Google X can generate glucose readings about once a second. Researchers are looking into integrating tiny lights that would warn when blood sugar levels go above or below threshold levels. TheGreenMechanics: With diabetes affecting one in every 19 people* on average, this would definitely help in many ways should it become reality. For good or bad, people at Google have came out with many creative innovations in the past. * - figure cited by Google.